Until very recently, there was no obvious way to access your old tweets. In fact Twitter imposes a limit of 3200 tweets (the more recent ones that is) that an application can access. This means also that you cannot delete your old tweets. 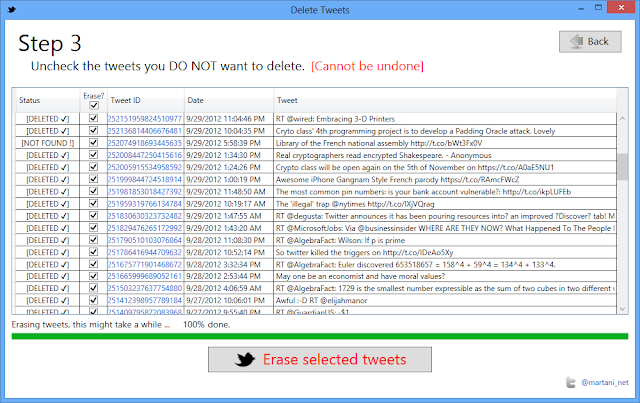 Several tools exist to help you delete your old tweets but, according to my experiments, most of them do not work properly due to Twitter API's limitations. Last week however, Twitter enabled the option for users to download their whole archive of tweets, which contains among other things the IDs of all the tweets of a user, the exact piece of information that can be used to wipe out any tweet. I have developed a simple application called "Twitter Archive Eraser" that helps you delete the oldest tweets from your timeline, or wipe out the whole archive too if you would like so. The application is the simplest possible, it works in 3 steps: authenticate Twitter, select which tweets you want to delete, wipe them out. In this step, you give access to Twitter Archive Eraser to your twitter account so that it can delete the tweets you select. This works by providing a Pin number that twitter provides after authentication. 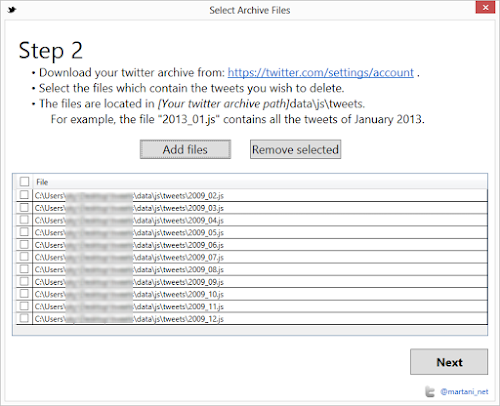 After you download your twitter archive (from https://twitter.com/settings/account) and extract it (to C:\Twitter_archive for example), you choose which tweets from your archive to delete. The tweets in the Twitter archive are grouped by month, ie. all the tweets of a month are stored in the same file. These files are found in [your Twitter archive path]\data\js\tweets. 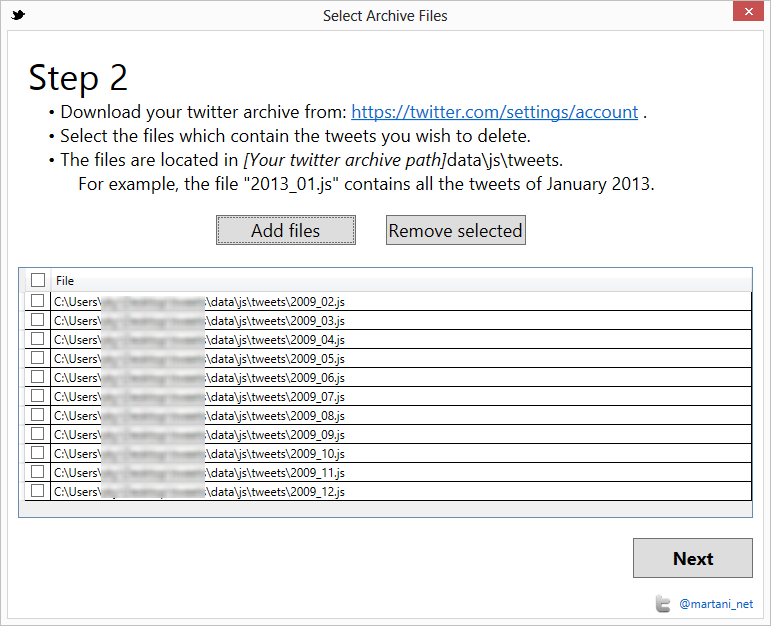 For instance, to delete the tweets from September 2009 you choose the file 2009_09.js. Once you have selected the correct files, you are now presented with all the tweets contained in these files. By default, all the tweets are marked for deletion, if you want to keep any specific tweets, you uncheck them as shown in the following picture. 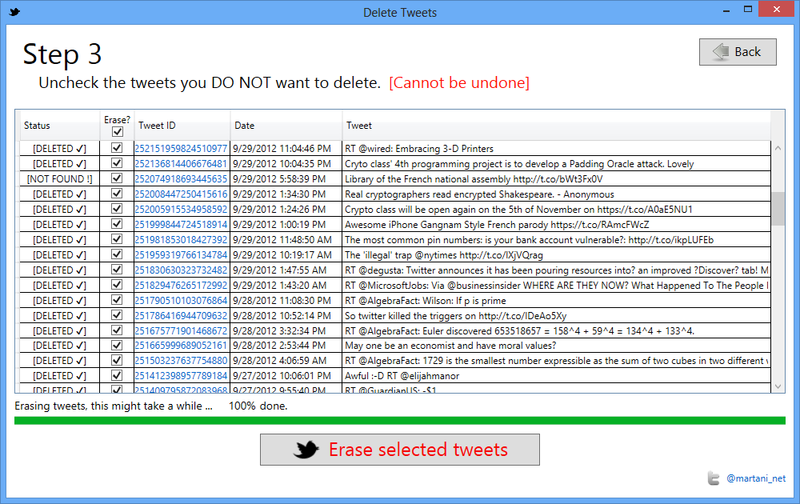 One you hit "erase selected tweets" button, there is no going back (unless you force the app to exit!). You can find the code of the application on github: https://github.com/martani/Twitter-Archive-Eraser. All the Twitter logic is done using the excellent LinqToTwitter library.